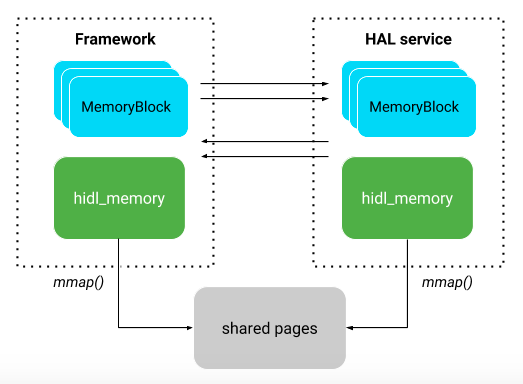 The HIDL MemoryBlock is an abstract layer built on hidl_memory, HIDL @1.0::IAllocator, and HIDL @1.0::IMapper. It is designed for HIDL services that have multiple memory blocks to share a single memory heap. Using per hidl_memory for each buffer allocation averages 238 us/1 allocation. Using MemoryBlock and sharing a single hidl_memory averages 2.82 us/1 allocation. This section provides an example of using MemoryBlock by first declaring the HAL then implementing the HAL. Get the hidl_memory (for details, refer to HIDL C++). Allocate MemoryBlock, which is a struct defined with HIDL. Review the flow to determine if you need to lockMemory. This section provides details about the extended usage of MemoryBlock. In most situations, the most efficient way to use MemoryBlock is to explicitly allocate/deallocate. However, in complicated applications using reference count for garbage collection might be a better idea. To have reference count on MemoryBlock, you can bind MemoryBlock with a binder object, which helps to count the references and deallocate the MemoryBlock when the count decreases to zero.